When cooking chicken lately, I have been cooking and enjoying dark meat for its deeper flavor and more forgiving texture. Yet, one weakness of my usual turkey recipes is getting the breast to correctly cook (to 160-degrees) without sacrificing the dark meat. I rarely time the flip correctly. So when I saw this episode on America’s Test Kitchen last month, I was amazed and happy to see how it showcased the dark meat. By separating the turkey into three major pieces, some of the most fundamental Thanksgiving issues are solved. (1) Getting the dark meat cooked properly without overcooking the white meat. (2) getting real turkey drippings into the stuffing. As a bonus, this method cooks the turkey in about half the time, freeing up my oven to cook rolls, pies, and gravy the rest of the day. There are a few issues (discussed below), but overall this technique provides a delicious turkey. It was the best dark meat I’ve ever eaten. Chris Kimball agrees, saying “this is now my new, absolute favorite.” 4-1/2 stars. I hope you all had a delicious Thanksgiving. Start the day/evening before, taking care of most of the prep work. Cut the turkey into three major parts, (1) breast/wings, then (2) cut off each leg/thigh quarter. I misread the instructions and started to cut off just the leg; not the entire leg quarter (i.e. including the thigh), but realized my mistake before I did any damage beyond the skin. The recipe only brines the breast/wings. It salts/seasons the leg quarters separately. What makes this recipe truly unique is removing the thighbones, then trussing the thighs up using skewers and string. This step makes the dark meat the absolute best part of the entire evening. I was hesitant to break the tradition of roasting a whole turkey, but with my guests arriving just before dinner this year, it was a great opportunity to give this recipe a try. Mostly because Chris Kimball says it is based upon Julia Child’s recipe. Start time 1 PM. Dinner time 6 PM. Remove the neck and giblets and set aside in a large Dutch oven, which will be used along with back and thigh bones to make the gravy. 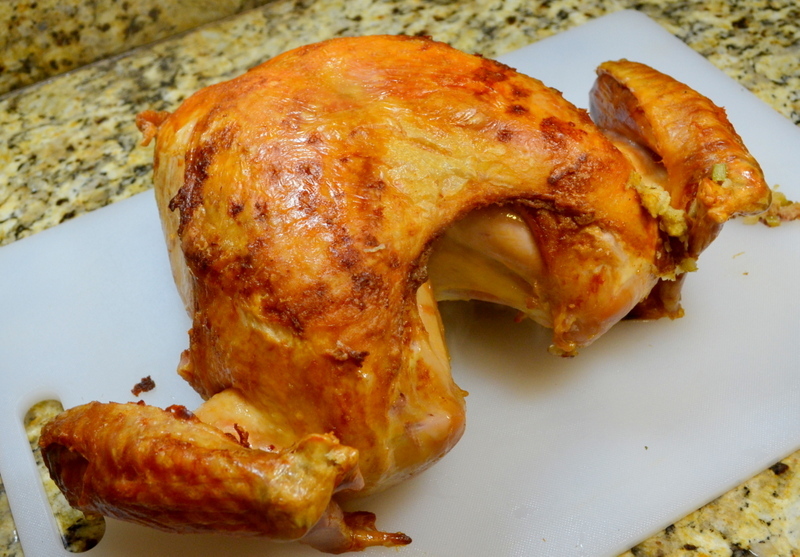 Put turkey breast-side-up on a cutting board. Tuck the wing back just to get it out-of-the-way. Remove the thighs/legs by cutting through the skin around the quarters where it attaches to breast. Cut away the top of the meat until your knife reaches the hip bone. Bend the entire leg quarter back so that the bone pops out of the hip socket, then you can continue to cut the meat away and remove entire quarter. To take out the thigh bone, use the tip of your knife to cut along the length of the thigh. Cut around the tip of the bone and work your knife underneath the bone to expose the joint between thigh and leg. Cut through the cartilage and remove thighbone; adding bones to your pot for the gravy. Repeat to remove the second leg quarter. Poke 2 or 3 skewers through skin/meat to close up the thigh where your removed the thigh bone. Wrap some kitchen twine around the wooden skewers to tightly close the thigh into a nice, round piece of boneless meat. Set on a large plate, cover, and refrigerate for 6 to 12 hours until ready to cook. Trim away and discard any excess skin from around the neck. Use a little force to bend the back-section away from the breast, and the shoulder joint should pop out of the socket. Cut between the bonds to separate the back from the breast, and add the back to the pot for making gravy. Dissolve 3/4-cup salt into 6 quarts of cold water in a large container (I used a large stock pot). Submerge in brine, cover and refrigerate for 6 to 12 hours until ready to cook. Cut bread into 1/2-inch cubes (including the crust). Spread on-top 2 rimmed baking sheets and bake at 300-degrees from 25 to 30 minutes until it becomes dry and lightly browned. Stir a few times during baking and empty into the largest bowl you own. An hour before you are ready to start cooking turkey, begin baking the bones reserved gravy. Pre-heat oven temperature to 425-degrees, and set two over racks to the lowest and second lowest positions. Remove the breast from brine and pat dry using paper towels (leaving the leg quarters in refrigerator for now). Tuck the wings behind back. Melt down butter in 12″ non-stick oven-safe skillet over medium heat. Add onions and cook for 10 to 12 minutes, stirring occasionally, until they have softened and are just beginning to brown. Meanwhile, mince 2 tablespoons of fresh sage and 6 celery ribs. Add minced celery and sage to skillet, plus 1-1/2 teaspoons pepper. Continue to cook for 3 to 5 minutes until celery is slightly softened. Empty vegetables into your large bowl with the bread cubes. Use paper towels to wipe out skillet. Brush surface of breast with 2 teaspoons vegetable oil and set turkey breast with the skin-side-down into skillet. Roast at 425-degrees for 30 minutes. Place a foil-lined baking sheet on the rack below turkey to catch any drippings. Meanwhile, add cranberries and beaten eggs to bread mixture and toss to combine (mixture will be dry). Empty stuffing to 16″x13″ roasting pan, then use a rubber spatula to form an even 12″x10″ rectangle. The turkey will be set on-top of stuffing to protect it and prevent it from burning. Brush leg quarters with 1 teaspoon vegetable oil and arrange over the remaining stuffing. Lightly season lets and breasts with salt. Reduce oven to 350-degrees and continue cooking for between 40 minutes and 2 hours; until breast registers 160 to 165 degrees and thighs registers 175 to 180 degrees. Empty onto a cutting board as each individual piece attains the proper temperature. Allow to rest for 30 minutes before carving. While turkey rests, use a spatula to stir stuffing and scrape up any browned bits. 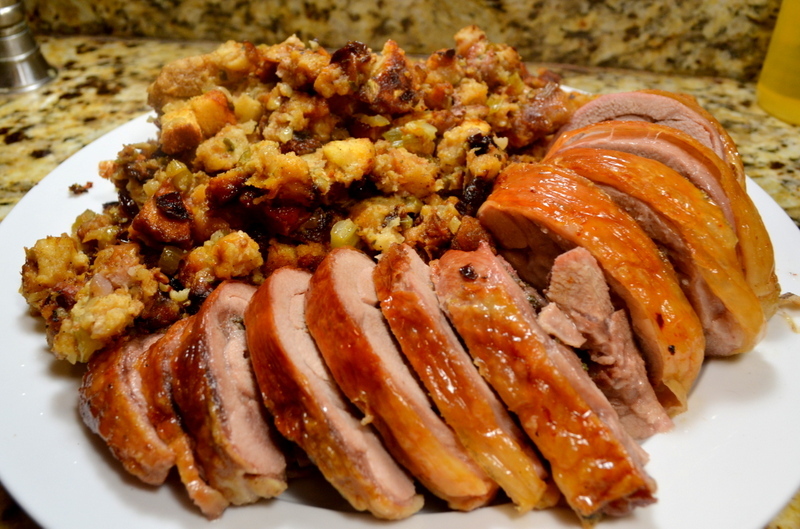 Evenly rearrange stuffing over the entire roasting pan and keep warm in the tured-off-oven. Before serving, adjust seasoning of the stuffing with salt and pepper to taste. Arrange the stuffing in center of large serving platter. Remove skewers and twine from leg quarters. Carve and serve. Of all the holidays on our busy calendars, Thanksgiving is my absolute favorite. I love the simplicity of the celebrations. There are no presents to buy or expectations to fulfill (other than a bountiful meal). It is simply a day to share and appreciate the important people in our lives; wonderful friends, our family, and the people we love. As a bonus, since I love to cook, it usually means that I have a crowd to cook for. Especially on Thanksgiving: the more the merrier. Meat and Cheese plate: Salami, Ham. Boursin, Manchego, Jarlsberg. Red Wine; Malbec, from my time living in Argentina. I’m in the middle of my Thanksgiving preparations and don’t really have time to figure out how to make homemade chocolate syrup. But I have a few good reasons why I made time. First, my squeeze bottle of Hershey’s “Genuine Chocolate Flavored” syrup has been empty for a couple of weeks, and I feel bad because my son has been eating ice cream that clearly needed chocolate syrup. Second and more important, I had examined the ingredient list (in an effort to answer the question: what does “Genuine Chocolate Flavor” really mean? ), and was very disappointed with Hershey’s choice of ingredients. It’s as if they had purposefully tried to use the worst possible ingredients. The first two ingredients are: (1) high fructose corn syrup, and (2) corn syrup. Really, using just regular corn syrup was too difficult. This homemade recipe uses regular sugar, and I omitted the other chemicals and artificial flavors. Finally, instead of using real vanilla Hersey’s uses “Vanillin”, so they are obviously using imitation vanilla made from a wood pulp waste product. Hershey’s isn’t tricking us by calling it “Genuine Chocolate Flavor”, as I had assumed. Chocolate includes both Cocoa powder and Cocoa butter, whereas chocolate syrup includes only cocoa powder. It is a non-fat product (a good thing) and thus by excluding the Cocoa butter, Hershey’s cannot call it Chocolate. Hence the phrase “Genuine Chocolate Flavor”. Many people suggest using Dutch-processed cocoa, but I just used whatever I had in my kitchen, which was Hersey’s. Hershey’s is natural cocoa powder; not Dutch processed. 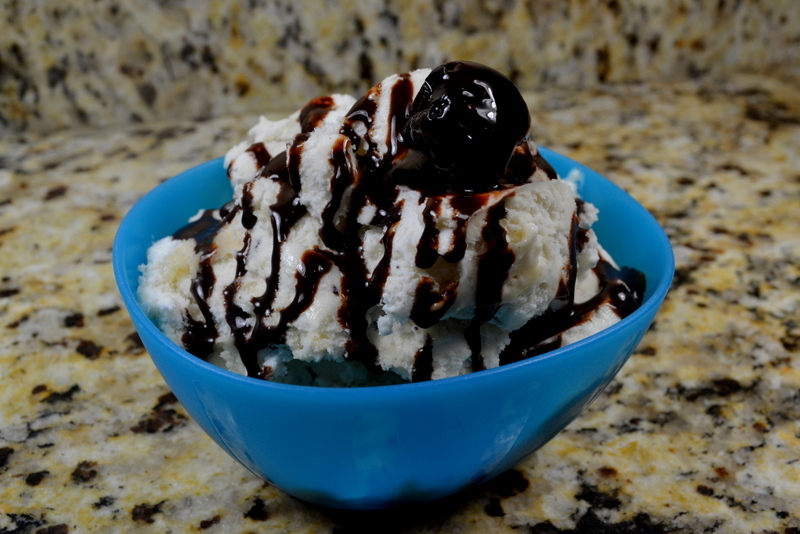 This recipe yields 18-ounces of chocolate syrup. I re-used the same Hershey’s syrup squeeze bottle, but eventually I imagine that I will just use a regular squeeze bottle. Also you can use regular mason jars. The recipe continues to be non-fat, which means that there is no cocoa butter in any of the ingredients. That could change depending up what type of cocoa powder you use. Cost: $1.15 for 18-ounces of syrup. Start time 5 PM. Dinner time 5:10 PM. While Chris Kimball does have a recipe to make chocolate syrup, I wanted a replacement for Hershey’s that has a stable shelf life. Chris Kimball uses dairy (heavy cream and butter) which means that it must be used within a short period of time. Today’s recipe is based upon Alton Brown’s cocoa syrup recipe. Mix sugar, water, corn syrup, and kosher salt in medium-sized pot and bring up to a boil. Whisk in cocoa powder and continue mixing until it is dissolved. Boil for 1 minute, and remove from burner. Stir in vanilla extract. Allow to cool to room temperature. You can either strain into squeeze bottles: in case you have a lot of solids that could plug up your bottle. Store in refrigerator. While the recipe will appear to be too runny, it will thicken when it cools to refrigerator temperature. It snuck up on me, but the time has come. Thanksgiving preparations begin now. 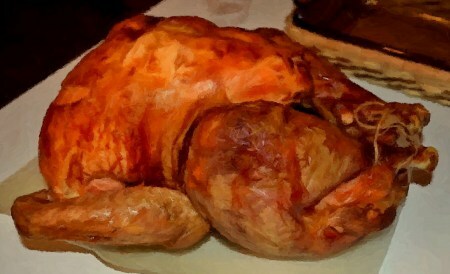 I need a full week to fully defrost my big turkey (plus a day or two to prepare it). When planning on what size Turkey to buy, a general guideline is to plan for 1-1/2 pounds per person (assuming you want leftovers). Without leftovers you can get away with 1 pound of turkey per person. I’m planning for a crowd of between 12 and 14. So I need approximately 20-pounds. If you are buying a frozen Turkey, it is essential that plan ahead. A large turkey will take a full week prior to Thanksgiving. In my case, my refrigerator seems to run a little cold. Every year I need an extra day or two to fully thaw my turkey. Thaw your turkey by keeping it in its original wrapping, placed on a rimmed sheet pan on the bottom shelf of your refrigerator. Thawing guidelines are generally 5 hours per pound, but I haven’t found those guidelines are accurate for large turkeys. 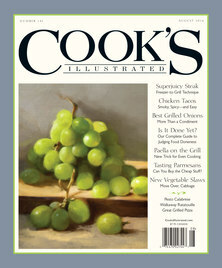 Cooks Illustrated cites 1 day for every 4 pounds of turkey. With about 5 days to go you should have your menu planned, and you should have selected which recipes you will use. Different recipes will require different slightly different ingredient lists. This weekend is when most people do a majority of their Thanksgiving grocery shopping, so go early in the day to try to beat the crowds. Ultimately, patience will be required no matter what time you go. Hopefully you can finish most of your major shopping early on Saturday, as the availability of key items diminishes. Especially prone to selling out are items for pumpkin pie and fresh spices; especially thyme and sage. Cranberries. Ocean Spray supplies 75% of the total world-wide market of cranberries, but has a 100% monopoly on the supermarket supply of cranberries in my area. The lack of competition has resulted in inferior berries. I usually have to throw away up to 1/4 of the bag, because they sell unripe berries intermixed with ripe one. The monopoly means that I have no alternative. Russet Potatoes, 6 or 7 onions, 1 bunch of celery, a few carrots, garlic, sage, thyme, maybe parsley (but you can usually find parsley). Canned pumpkin, evaporated milk, pie dough, ground cloves (you can substitute whole cloves and grind them yourself, using a spice grinder or mortar and pestle). Bread Cubes or high-quality sandwich bread. While Pepperidge farms stuffing is ubiquitous, it’s just as easy to make your own using high-quality sandwich bread. Arnold Country Classics White Bread (24oz) is Cook’s Illustrated choice, but Pepperidge Farm Farmhouse Hearty White Bread Celery was the runner up in the CI taste test. Chicken Stock. Make sure you have at least 4-cups for gravy and stuffing. I have already made a fresh batch of homemade chicken stock. This year my gravy recipe alone calls for 3-1/2 cups. Actually, this year I used spare turkey bones to make turkey stock. Butter. Be sure you have at least a pound, but butter usually goes on sale around Thanksgiving. I usually pick up a few pounds of Land o Lakes for $2/lb, and freeze any extra. (This year it’s a little more expensive, and it seems like $3/lb is the lowest price). Heavy Cream For mashed potatoes and maybe whipped cream for pie. A few eggs (for stuffing). Any specialty items: White wine for gravy, Salt pork, sausage, kosher salt. This year I need 1 cup dried cranberries for the stuffing. Snacks for Thanksgiving Day: Chips, Salsa, Cheeses, Sandwiches. These items don’t generally sell out, but it’s nice to know that you have one fewer thing to worry about. Take stock of the status of your turkey. Is it soft? Or is there any chance that the turkey’s interior is still frozen? If it’s still partially frozen, then you should thaw it in a clean bucket filled with cold water (leaving turkey pre-wrapped). I don’t have any buckets large enough for my 20-lb turkey, so I use a sink lined with a large trash bag. Depending upon how frozen your turkey is, it can be completely thawed in just a few hours. Of course, don’t thaw using anything other than cold water at this point. On Wednesday morning, assuming your turkey is thawed, brine or salt the turkey. Lately I’ve been salting because it leaves the skin more appealing. Mix the pumpkin pie filling, which will taste better if you mix the night before. Decide when you plan to bake your pumpkin pie. Your options are (1) early, an hour before the turkey goes in the oven, or (2) immediately upon taking the turkey out of the oven. I am going with option 1. Option 2 will require a little cooling time in the refrigerator so that it is cool enough to firm up. There is a school of people who make it the night before and leave it at room temperature until dessert the next day (I’d be too worried about potential bacteria to even consider this). 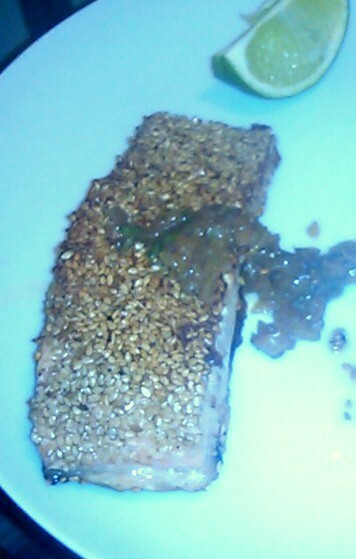 About 6 months ago, I made this delicious, similar Sesame Crusted Salmon with Lime and Coriander, which was 4-1/2 stars. That success gave me high hopes for Today’s recipe, which is nearly 15 years old (the 4-1/2 star recipe was from March 2014). Unfortunately, today’s recipe was only 3 stars. Still edible, but just an average meal. Even considering the chutney, the recipe was too plain. The seasonings were generally warm, but I think that the vinegar in the recipe was a lackluster substitution for a more traditional citrus. The recipe lacked anything to brighten the dish. Part of the fault may lie in the age of this recipe; which is older than my 15-year-old son. I am more than a little embarrassed by my “worst ever” cell phone picture, which makes this average meal appear sub-par. That’s the reason I’ve hidden it at the bottom of the post. While it only takes a few minutes to make this chutney, prepare it before cooking the salmon (because the fish cooks so quickly). A little of this intensely flavored condiment goes a long way. Because I don’t have cardamom (and didn’t feel like buying a $10 bottle just for this recipe), I used equal parts cinnamon and ground nutmeg. Because the recipe only used 1/4 teaspoon I doubt that this substitution is to blame for the disappointing results. The recipe says to cook the salmon in Step 3 for 3 minutes for medium-rare and 3-1/2 minutes for medium. Start time 5 PM. Dinner time 6 PM. In a small bowl, add 1 teaspoon fennel, 1/2 teaspoon cumin, 1/2 teaspoon coriander, 1/4 teaspoon cardamom, 1/4 teaspoon paprika, 1/4 teaspoon table salt; mix and set aside. Finely chop 1/2 of a medium onion, which should yield about 1/2 cup. Set a medium-sized skillet over medium burner. Heat 2 teaspoons olive oil, then sauté onion for 3 to 4 minutes until soft. Add spice mixture from step 1, and sauté for 1 minute until fragrant. Turn up burner to medium-high and add 1/4 cup vinegar, 1 tablespoon sugar, and 2 tablespoons water. Cook 1-1/2 minutes until it reduces by one-third and attains a syrupy consistency. Stir in minced parsley, set aside until ready to serve salmon. Preheat a 12″ heavy-bottomed skillet for 3 minutes over high burner. Rub salmon fillets with 2 teaspoons canola oil, sprinkle with salt and pepper. Spread sesame seeds in a pie plate, and press flesh sides of fillets in sesame seeds to coat. Add 1 teaspoon to pre-heated pan; swirl to coat. When oil begins to shimmer (but is not smoking) add the fish with skin-side down. Without moving the fish, cook for 30 seconds until pan regains its heat, then reduce burner to medium-high. Continue cooking for 4-1/2 minutes until skin-side becomes well browned and bottom half of fillets turns opaque. Carefully flip fish and cook for 3-1/2 minutes, again without moving, until they are no longer translucent and have become firm, but not hard, when gently squeezed. Serve immediately with the chutney. Ceviche is one of my favorite things about visiting the Caribbean (see here, here, here, here, here, here and here). Of course, ceviche is “cooked” in citrus juice rather than being thermally cooked. While its important to understand the potential risks about eating “raw” seafood (see here), I personally have never allowed the slight risks from stopping me from enjoying ceviche. I rely on my judgement to select the right restaurant (not-to-cheap-price, cleanliness). I’ve also made something similar but gently cooking the shrimp. Frozen seafood cannot match the flavor and texture of fresh, Caribbean seafood, but it still work making at home. This version has more peppers and vegetables that I generally get in the Caribbean. It is more like a citrus seafood salad. It is still delicious. 4-stars. 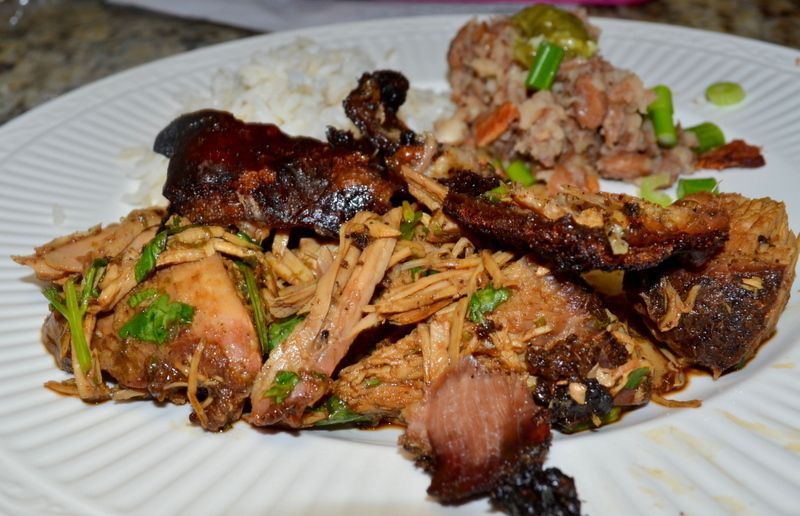 I served it with this Pernil. 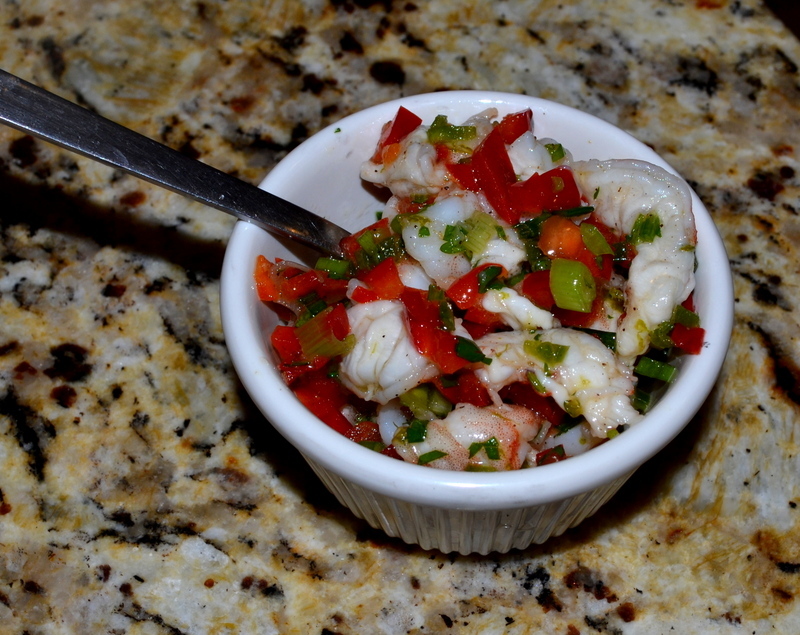 After waiting the 1 hour listed in my recipe, the ceviche still looked semi-raw. I wanted to wait until the entire exterior lost it’s brown, translucent appearance. Finally after 3 hours the shrimp appeared completely cooked. I exclusively used shrimp, but the recipe is written to also work with sea scallops, skinless fish fillets, or any combination. I believe that it would be important to cut them in very similar sized pieces, so that they will finish “cooking” at the same time. Start time: 2:30 PM. Ready at: 6:00 PM. If using shrimp, peel them completely, devein (if not already done), and use a paring knife to slice each shrimp in half lengthwise (through the deveined groove in the shrimps back). If using scallops, remove the side tendon and cut into 1/3″-thick rounds. If using fish, remove any bones and cut into 1″ squares that are 1/3″-thick. Add the lime zest, lime juice, lemon juice, bell pepper, jalapeño, garlic, and 1/2 teaspoon salt to a medium bowl. Stir until combined. Gently stir in the seafood, and cover with plastic wrap. Refrigerate for 60 minutes (it took mine 3 hours) until the seafood becomes firm, opaque, and it appears cooked. Stir halfway through the marinating time. Drain the mixture though a fine-mesh strainer, discarding the liquid. Leave it a little wet, and return to the bowl. Gently stir in the oil, scallions, cilantro, and sugar. Season with salt and pepper to taste before serving. The menu for my big Mexican dinner party (which happened last night) has been planned for a few weeks. Then, two days before the party, I was watching Cook’s Country and heard Chris Kimball declare his latest recipe to be “the best pork recipe he’s ever eaten.” Sure, I hear that every few episodes, but the final pork looked amazing. So I switched my theme from Mexican to Latin. I added ceviche, but left the Mexican Chicken Flautas on the menu. I also made a homemade tomatillo sauce. The pork was absolutely delicious; flavorful, tender. Yet without a doubt, the crispy pig skin was the best part of the entire meal. The recipe softens the skin by soaking it in water while baking at pretty high temperature for 4 hours. It’s as if the entire recipe is crafted towards perfecting the skin; the piece de resistance on an entirely delicious meal. The only flaw in the recipe is that the wonderful flavors of the sofrito do not permeate into the meat; even after 24-hours marinating. Instead of the complexity of the sofrito, the final presentation of the dish relies on a much simpler lime/cilantro jus. 4-1/2 stars. Definitely worth the 6-1/2 hours. To overcome the recipes main flaw, a Latin friend says her sister pokes holes all over the roast with a big knife. Allowing the Sofrito, or Recao as she called it, to flavor the entire roast rather than just the exterior. About 4 hours into the recipe I had a near disaster, so I offer this warning. Do not treat the 4 hours of cooking in steps 3 and 4 as virtually unattended cooking time. After you remove the foil, starting with step 4, plan to add 1 to 2 cups per hour. In my case I caught it just in time to save the drippings. Another 15 minutes and I could not have made the Jus. The 1 hour of cooking in Step 6 only brought my port up to 180-degrees. It took an extra 35-to-40 minutes to attain 195-degrees. While not described in the original recipe, the step of crisping the skin (step 8) had an added secret, which was very subtly shown on the Cook’s Country episode. You can use balled up aluminum foil to hold your roast in perfect position so that the skin crisps evenly. I had to buy two bunches of cilantro to yield the requisite 1-1/2 cups. One bunch will give you enough for the night before dinner, but I had to make another trip to the supermarket the next day. Chris Kimball recommends serving this with plain, white rice. The day before you cook the meal, add 1 cup cilantro, onion, salt, oil, garlic, pepper, oregano, and cumin to food processor. Pulse 15 times until finely ground. You may need to scrape down sides of the bowl. Pat pork dry with paper towels and rub sofrito all over. Wrap pork in plastic wrap and refrigerate for at least 12 hours or up to 24 hours. Start cooking 6 hours before dinner. Set a rack to lower-middle of your oven and pre-heat to 450-degrees. Pour 8 cups water into a large roasting pan. Unwrap pork, place in pan with the skin-side down in the water. Cover pan tightly with aluminum foil and roast at 450-degrees for 90 minutes. Remove foil, and turn down oven to 375-degrees. Continue roasting uncovered for 2-1/2 more hours. Prepare a V-rack by spraying it with non-stick vegetable oil spray. Prepare a rimmed baking sheet by lining it with foil (for easy cleanup). Remove pan from oven, and set V-rack with pork in prepared baking sheet. I saw on the Cook’s Country episode that they make the roast level by creating a ball of foil to support the flatter end. Return to oven, and turn up the oven temperature to 500-degrees. Cook for 15 to 30 minutes; rotating sheet halfway through cooking. It will be done when the skin becomes well browned and crispy., and you can tap it lightly using tongs and it should sound hollow. Allow pork to rest for 30 minutes on a carving board. Meanwhile, pour juices from pan into fat separator. Allow to settle for 5 minutes, then pour off 1 cup of the de-fatted juices into large bowl. If you don’t have 1 cup, then make up the shortfall using water. Whisk 1/2-cup cilantro, lime zest, and lime juice into bowl with the de-fatted juices. Remove crispy skin from pork in large pieces. Chop skin coarsely into bite-size pieces and put in serving bowl. Trim and discard any excess fat from pork. Remove the pork from the bone and chop it coarsely. Transfer pork to bowl with cilantro-lime sauce and toss to combine. Serve pork, with crispy skin on the side. You are currently browsing the My Year Cooking with Chris Kimball blog archives for November, 2014.